Background: Upfront screening for dihydropyrimidine dehydrogenase (DPD) deficiency in patients scheduled for 5-FU should help to reduce the risk of toxicities by preventive adaptive dosing. Our group has developed a simple functional testing categorizing patients upon their DPD status, i.e. extensive metabolizer (EM) or poor metabolizer (PM) patients, using UH2/U ratio measurement in plasma as a surrogate for DPD activity. 5-FU dosing can be next tailored according to DPD deficiency status. Objectives: We present here an observational study of this strategy implemented in routine clinical practice when treating head-and-neck cancer patients. Results: A total of 218 evaluable adult patients were treated with a 5-FU-regimen, with DPD-based adaptive dosing. 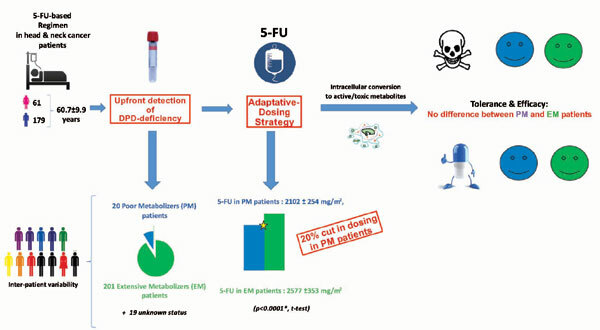 Among them, 20 (9%) were identified as PM and received subsequently a 20-50% reduced dosing of 5-FU as compared with EM patients (2102 ±254 mg VS. 2577 ±353mg, p<0.001 ttest). Gender (Female) was associated with higher risk for being PM (p=0.01, Pearson's Chi squared test). Overall, early severe toxicities were seen only in 5% of patients, all being EM with standard dosing. Similarly, overall severe toxicities were observed in 12.8% of patients only, both figures being markedly lower than usually reported with standard 5-FU. Despite the average -20% reduction in 5- FU dosing between PM and EM patients, clinical efficacy was not statistically different between the two groups (p = 0.2774, chi-square test). Conclusion: This study shows that 5-FU-related toxicities can be greatly reduced in routine clinical practice by the upfront detection of DPD deficient patients with simple adaptive dosing strategy. 5-FluoroUracil, head and neck cancer, dihydropyrimidine dehydrogenase, adaptive dosing, DPD deficiency, efficacy, toxicity.